In my quest for low sugar jam options, here are a few things I’ve learned along the way about the natural chemistry behind homemade preserves. 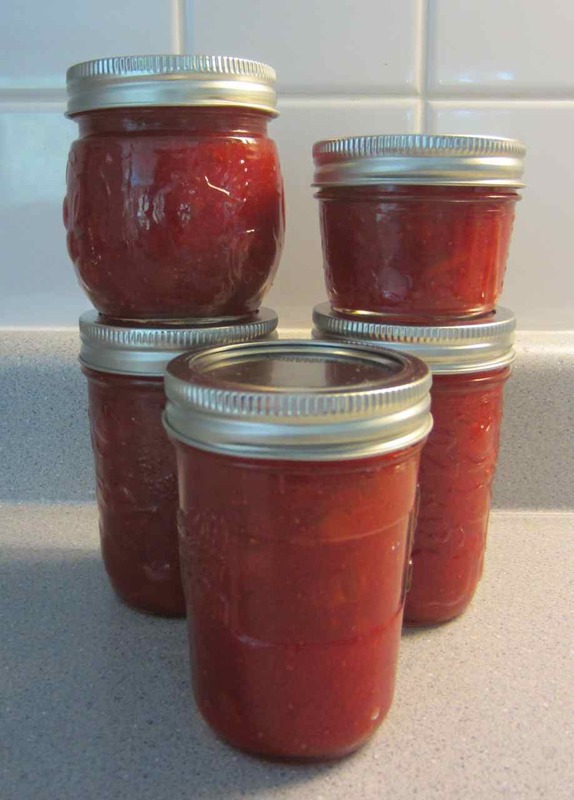 Food is either high acid or low acid which influences the canning process you chose. In a nutshell, high acid means there’s enough natural acid to kill botulism spoors so you can use a simple hot water bath (in a canning pot). Low acid foods need help killing any wayward botulism so they require a pressure cooker which reaches the higher heat required. Thankfully jam falls into the former category because pressure cookers kind of freak me out. In order to get the desired consistency of jam you need just the right balance of pectin, acid, and sugar. 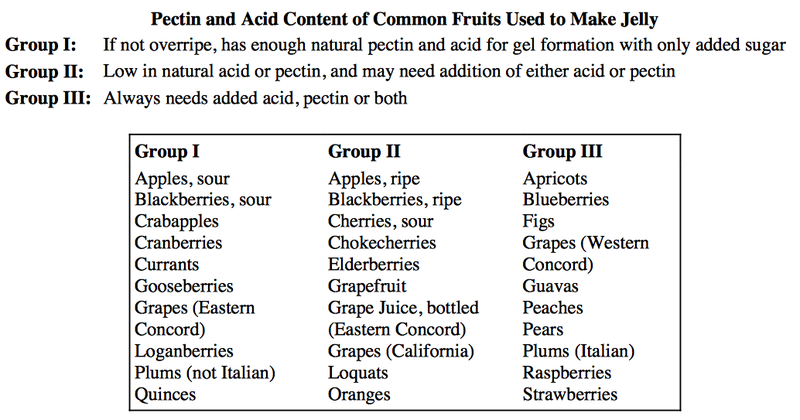 Pectin is naturally present in most fruit but levels vary. The addition of acid, often in the form of lemon juice, helps draw out pectin in fruit that is naturally low in pectin or is overripe and past its pectin prime. (Fruit has the highest rate of pectin just before it fully ripens.) 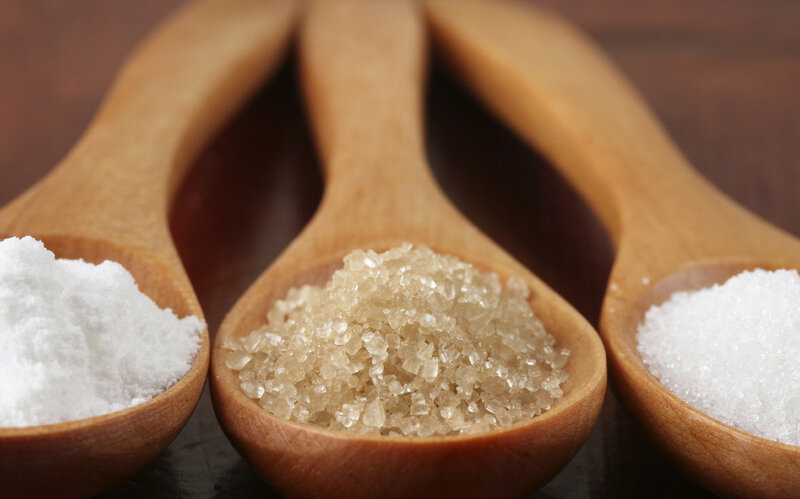 Sugar aids in the gelling process and helps preserve fruit’s natural vibrant colour, as well as prolonging shelf-life once a jar has been opened. If you’re going to be experimenting with various fruit combinations as I intend to, it’s a good idea to know the pectin and acid content of each. Want to get all nerdy and scientific? (Why yes, I do.) It’s even possible to test the pectin in your fruit yourself. This is cool. Extract 1 Tbsp. of juice from your fruit and pour it into a small, glass container. Add 1 tsp. sugar to the liquid. Add 1½ tsp. epsom salts and stir until all of the solids are dissolved. Let stand for 20 minutes. If after 20 minutes you have a gelatinous mass, there is sufficient pectin in your fruit to make jam or jelly. Or, check what level of pectin your fruit contains with a method using denatured alcohol. If you don’t mind having as much sugar as fruit in your jam, you can use regular commercial pectin like Certo or Bernadin in crystals or liquid form. However, if you want low sugar options Bernardin No Sugar Pectin is a good alternative. This is a handy product, readily available anywhere you purchase canning supplies, that allows you to use no added sugar, regular sugar, honey, or even completely unnatural, carcinogenic artificial sweetener. In my search for no- and low-sugar jam recipes I came across another attractive option at my favourite natural foods store, Pomona’s Universal Pectin, which allows the flexibility of experimenting with all manner of sweeteners including agave syrup, maple syrup, frozen juice concentrate and stevia, in addition to the usual suspects. 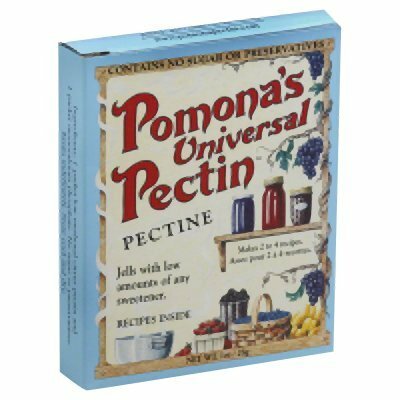 It’s of interest to note that the Pomona product uses a slightly different chemical process (via all-natural chemistry, of course) than typical commercial brands of pectin and unlike the other products mentioned contains no sugar at all. Unlike the other brands, each box is also good for several batches rather than a single batch. With all of this great research under my belt, the time has come. May the games, and experiments, begin.